In this article, you will learn how to create a Borderless Entry using Custom Renderer in Xamarin.Forms. The Xamarin.Forms code runs on multiple platforms - each of which has its own filesystem. This means that reading and writing files are the most easily done tasks using native file APIs on each platform. Alternatively, embedded resources are also a simpler solution to distribute the data files with an app. Xamarin.Forms user interfaces are rendered using the native controls of the target platform, allowing Xamarin.Forms applications to retain the appropriate look and feel for each platform. 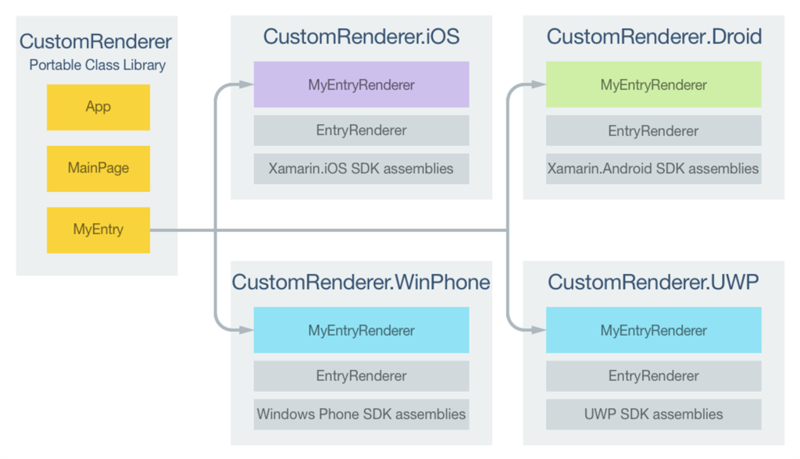 Custom Renderers let developers override this process to customize the appearance and the behavior of Xamarin.Forms controls on each platform. Now, select Blank App and choose Portable Class Library (PCL). In this step, create a default Entry control with border. Now, write the following code. Now, create an Inherit class form Entry for customizing the entry control. In this step, create an inherit Class form, EntryRenderer for customizing Entry control. Add a customized Entry control to your app. Go to MainPage.Xaml and write the following code. I hope you have understood how to create a borderless Entry.